but, some are in full bloom. The poppies definitely brightened the day. I am accustomed to seeing red or orange poppies, so the splashes of other hues was intriguing. If the air is a bit chilly, you can still benefit from ducking into the greenhouses. Chicago Botanic's three greenhouses always provide for cheerful greenery throughout the year and even some brilliant blooms as well! The Chicago Botanic Garden has an impressive collection of bonsai. After a winter away, they are back out in the bonsai garden. Always amazed by the talent of gardeners that prune these breathtaking creations. The amount of care and dedication is astounding. One of my favorites is the one below that appears as if it is a mini forest. If you look closely, you can see it is one tree. We also spent a little time in the English Walled Garden. The Chicago Botanic has several water features throughout. Some are small and soothing and some are more dramatic. 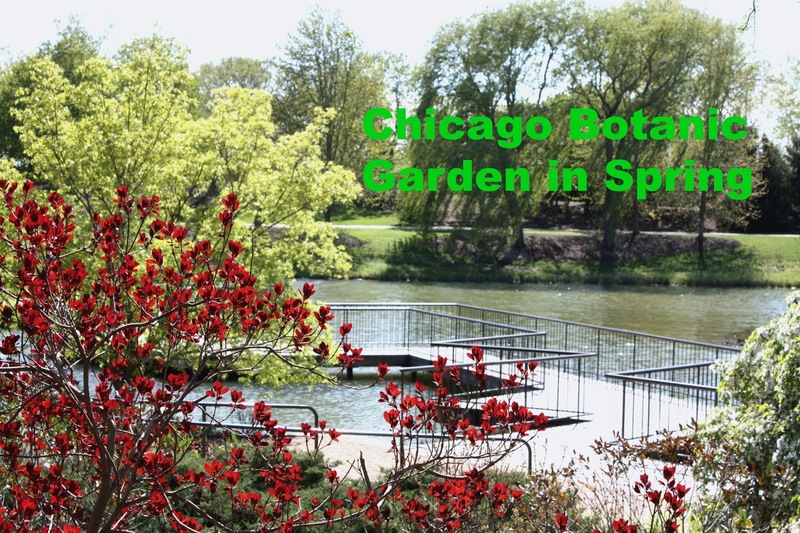 As you can see, spring is quite a beautiful time to visit the Chicago Botanic Garden -- abuzz with activity and coming alive with splashes of color throughout! We are so lucky to have both Botanic Garden and Arboretum. Between those we get to experience the best of 4 seasons of mother nature. We love Japanese Gardens and the Bell Tower at CBG.